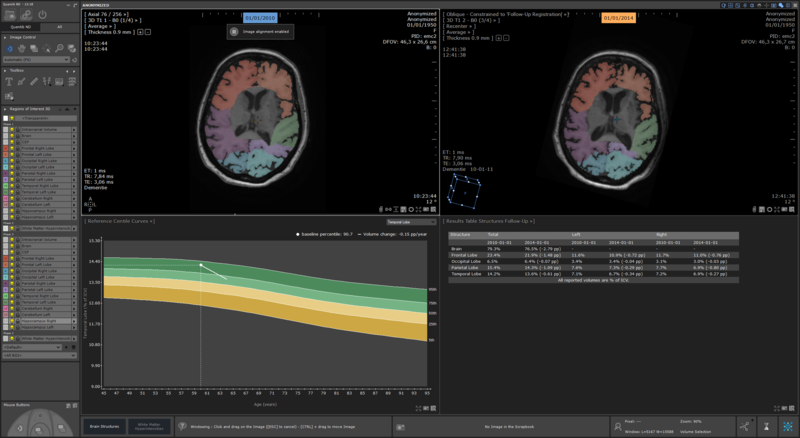 Quantib, the market leader in artificial intelligence tools for radiology, released a major upgrade of their dementia and MS detection support software Quantib™ ND. A substantial list of new features supporting the detection and monitoring of dementia and multiple sclerosis was added to previous software functionalities resulting in a unique radiology software product. Next to offering accurate quantification of brain atrophy and white matter hyperintensities, as well as changes in the brain related to dementia and MS, the software proves to be a robust tool for objective disease development tracking. The product includes graphs providing information on the expected brain volume at a certain age. Physicians can leverage this information to compare the brain volume of their patient to that of a representative cross-section of the population, i.e. determine the difference between expected and measured brain volume. An advantage of the Quantib solution is the option to keep all scans within the hospital and process them locally; there is no need to upload patient scans to an external server. Quantib™ ND is installed on the premises of the institute; hence, patient scans are processed behind the hospital firewall, offering the most secure option to protect patient data. Additionally, the Quantib solution allows the user full access to the segmentations and not just a PDF report. The physician has complete control. Quantib™ ND is CE marked and available throughout Europe for specialists to accelerate and refine their diagnosis process. The software may be integrated into the current (PACS) workflow of radiology departments, making the results accessible directly from the PACS worklist. Alternatively, it may be installed as a dedicated post-processing workstation for the heavy users. Quantib strives for faster and more accurate diagnoses, supporting adequate and timely patient care. Using advanced machine learning techniques, Quantib’s products can detect changes in tissue sooner than would be possible with the naked eye. Quantib has multiple machine-learning products cleared by FDA and/or CE marked. These products are focused on the detection of dementia and MS. Simultaneously, the company is collaborating with, among others, Erasmus MC Rotterdam, for the development of applications in the oncology and MSK space. Curious to learn more about Quantib™ ND? Visit the Quantib™ ND webpage. Gates, B. Gatesnotes. Why diagnosing Alzheimer’s today is so difficult—and how we can do better (2018). Available at: https://www.gatesnotes.com/Health/A-better-way-of-diagnosing-Alzheimers?WT.mc_id=20180717193325_AlzheimersBiomarkers_BG-LI&WT.tsrc=BGLI&linkId=54393851. Livingston, G. et al. Dementia prevention, intervention, and care. Lancet 390, 2673–2734 (2017).